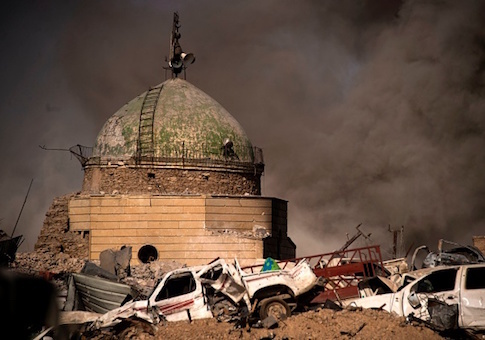 In the days leading up to the Islamic State's defeat in Mosul, the terrorist group turned to its propaganda arm to disseminate charges of American-led coalition forces of killing scores of civilians. The spokesman for the anti-ISIS coalition campaign in Baghdad, Col. Ryan Dillon, said the aim was two-fold: to pressure American-led forces to halt airstrikes and to turn the civilian population against Iraqi troops. "That is their overall goal—they do not want us to continue to strike because those strikes do help Iraqi Security Forces advance into ISIS-held territory," Dillon told the Washington Free Beacon. "Number two, they point fingers at us and say the coalition is responsible for strikes to incite hatred against us." On Friday, the ISIS-run Amaq news agency released a statement blaming coalition airstrikes for killing more than 100 civilians while wounding 220 others over a two-day span, according to SITE Intelligence Group. The accusation arrived three days before the U.S. and Iraqi forces declared victory in Mosul, marking a formal end to a violent offensive that spanned eight months and displaced some 87,000 residents. It is unclear whether ISIS was referring to a U.S. Central Command report released the same day confirming that coalition forces were responsible for 119 unintentional civilian casualties in Iraq and Syria over an undefined time period. Dillon did not comment on the CENTCOM report, but relayed first-hand accounts of the terrorist group forcing civilians and family members to blow themselves up among groups of residents and Iraqi soldiers as it faced defeat in Mosul. "Amaq will typically run things that are often not true, but one of the things we have seen, which was not just propaganda, is [militants] putting suicide vests and suicide belts on civilians … and forcing them to walk through Iraqi Security Forces," he said. "ISIS was holding all the cards, if you will, on the civilian population that remained in that final holdout [in Mosul]." He said he expects jihadists will deploy similar tactics in Raqqa as the U.S.-backed Syrian Kurdish and Arab forces close in on the group. The campaign to retake Mosul began in October and was carried out by Iraqi security forces, Kurdish Peshmerga fighters, and Shiite militias backed by U.S.-led coalition airstrikes. Though victory in Mosul dealt a significant blow to ISIS, U.S. coalition officials warned the fight against the group is not over. The White House has said coalition troops and partner forces would carry on the battle until ISIS is "annihilated." This entry was posted in National Security and tagged Iraq, ISIS, Terrorism. Bookmark the permalink.